One recent Sunday a good friend and I, having recently returned from our first year at Swarthmore College, decided to make a day of going to LACMA, my old haunt. We decided to see the Stanley Kubrick Retrospective, which I have reviewed separately here, as well as the new James Turrell retrospective. James Turrell is a California artist who is best known for his light- and mind-bending installations. My friend was particularly enthused by Turrell’s work, and I had read about him in my senior year studio art class, so we both entered the exhibit with some foreknowledge. 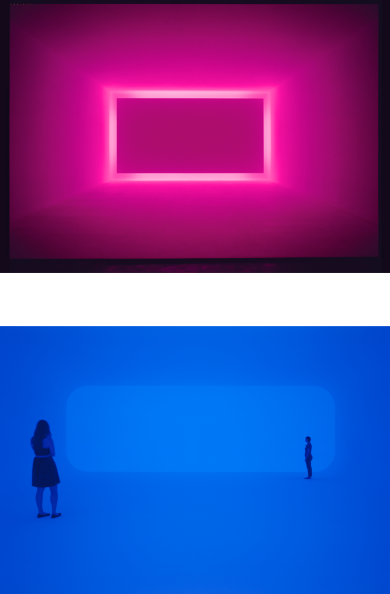 I wondered how a museum could feasibly hold a retrospective about Turrell’s light installations, since each project requires significant space for full effect. How could the museum show growth and scope in just a few rooms? Yet I could not have anticipated the degree to which this incredible retrospective, which spanned spaces in both the Broad Contemporary Art Museum and the Resnick Pavilion, completely exceeded my expectations, engaged my senses, and surpassed my hopes. The exhibit opens quietly on the second floor of the Broad Museum, with a room dedicated to Turrell’s prints. These prints are largely white geometric (often cubic) shapes projected on gray or black backgrounds. They are simple enough, providing but a taste of what is to come—the unique way in which Turrell engages the viewer in his full-scale installations. The viewer’s eyes create the three-dimensionality of the white forms of Turrell’s prints due to the subtle shifts in shades on the gray and black backgrounds. Reading about James Turrell’s works and seeing photographs of them in no way prepared me for the sheer wonder of seeing these installations in person. The next room houses the first such installation titled “Afrum (White)”, which the artist first created in1966. This installation consists of a darkened room with what appears to be a white cube set into a corner a few feet above the ground, made to look like it is projecting from the corner. There was no visible light source or projection in sight. The white pseudo-cube seems to emanate uniformly from within, like it is made of pure light energy. The other projecting installations on display follow a similar formula with different colors. The next room is “Juke Green (Corner Projection)” from 1968, which is a strange green shape set into a corner, glowing with an unearthly light. Similarly, “Raethro Blue”, also from 1968, is a diamond-shaped burst of purest blue, this time set into a convex wall addition in a corner. This work gives the room a strange green cast due to the contrast of blue installation and pale yellow ceiling lights. “Raemar Pink White”, from 1969, appears to be set into a wall as a rectangular border on the wall itself. The thin rectangle of pink light is alternately translucent or opaque depending on the viewing angle. Are the forms of light holes or cubes? Mirrors? Projections? Are they flat? Convex? Concave? Each installation defies categorization and understanding. Each work of art is its own little oasis of whatever color Turrell chose. Each pieces seems both timeless and futuristic, like it dropped onto Earth fully formed by someone with tools and visions we viewers do not understand. Each work is deceptively simple but impossible to make sense of. A fully sensory highlight of the exhibit is “Key Lime”, from 1994. To experience this installation, the viewer walks through a pitch-black passageway and comes upon a room upon a blue rectangular outline, which takes up a whole wall. Placed within (or behind?) this blue outline are increasingly smaller rectangles in different colors. This work challenges the viewer and does not give itself up to spatial comprehension. I, and the other viewers constantly wondered aloud: “Does this installation recede into a space within or behind the room? Is it a flat projection onto a wall? How was it made?” The viewer gains no understanding even after scrutinizing every inch of it. This installation is like a work of science fiction. “St. Elmo’s Breath”, from 1992, is similarly situated. It is a black room installation with a hazy rectangle of pink-purple located on the wall opposite the entryway. There is a simple majesty to this room that gives it a feel of some sort of sacred place. The edges of the form seem to tremble before the viewer’s eyes like a breathing organism as the colors appear to shift from purple to pink and back again. As I walked through this exhibit, I came to realize that Turrell’s works are an almost-collaboration with the viewer. He provides the raw material and the viewers have to shape it with their eyes and their minds into something they can understand and relate to. The exhibit continues in the Resnick pavilion. A full room and its adjoining space is dedicated to Turrell’s Roden Crater project, which is located in Arizona. The Roden Crater, an extinct volcano, has been an ongoing project for Turrell since the 1970s. In this massive undertaking, Turrell seeks to use the crater as a site for observing the sky and has created spaces and tunnels connecting them throughout the years. He seeks to engage the viewer with the power of light itself, this time using natural light but still in a strange, ethereal way. The crater also seems like something out of science fiction. It makes our own planet seem unfamiliar and fascinating and magical. The true highlight of this exhibit requires a bit of wait time, depending on demand, but it is absolutely worth the wait. Located in a side room of the Resnick Pavilion, “Breathing Light”, from 2013, is an interactive light installation that transports the viewers to another world. This work of art is a sunken box set into a wall, with a pyramidal set of stairs leading to the rectangular entryway. Once viewers climb up the stairs and through the the entryway, with its unnervingly thin walls, they come face-to-face with a massive wall made of pure light and color that gradually shifts in hue, bathing the entire sunken space in light. The box itself has no corners; the walls and floor curve to meet one another, creating an odd sense of standing in a colorful cloud with no hard edges. The viewers inside the box become part of the installation for the viewers waiting outside, down below, for their turn. My description cannot do this last installation justice, and it should not be missed. This retrospective is visionary and absolutely outstanding. Reading about James Turrell’s works and seeing photographs of them in no way prepared me for the sheer wonder of seeing these installations in person. These works give the viewers a chance to interact with art in ways they cannot with other artists. The retrospective runs through April 6, 2014 and it requires advance tickets for specific timed entry. Additionally, there is another part to this exhibit called “Light Reignfall”, which appears to provide the viewer with the experience of seeing inside a human eye. I did not see this part of the show, as it requires separate tickets was sold out at the time of my visit, but it certainly seems engaging. If you are in Los Angeles, do not miss out. Excellent review! You make the installations come alive in writing and, as you say, I am now intrigued to see the exhibit in person! "If you are in Los Angeles..." yeah, therein lies the problem. Regardless, my knowledge of Mr. Turrell is extremely limited and so this analysis was very helpful. Given the fairly self-evident reference contained within "St. Elmo's Breath," I would wonder to what extent it resembles that particular scientific phenomenon-- is it intended to evoke a similar sight, and if so, how effectively? MOVIE REVIEW: "Much Ado About Nothing"